New Haven Wedding Photography captures the special details of a wedding day in one of the oldest cities on the East Coast. New Haven was founded in 1638 by the Puritans, although the area was visited by Dutch explorers prior to that. 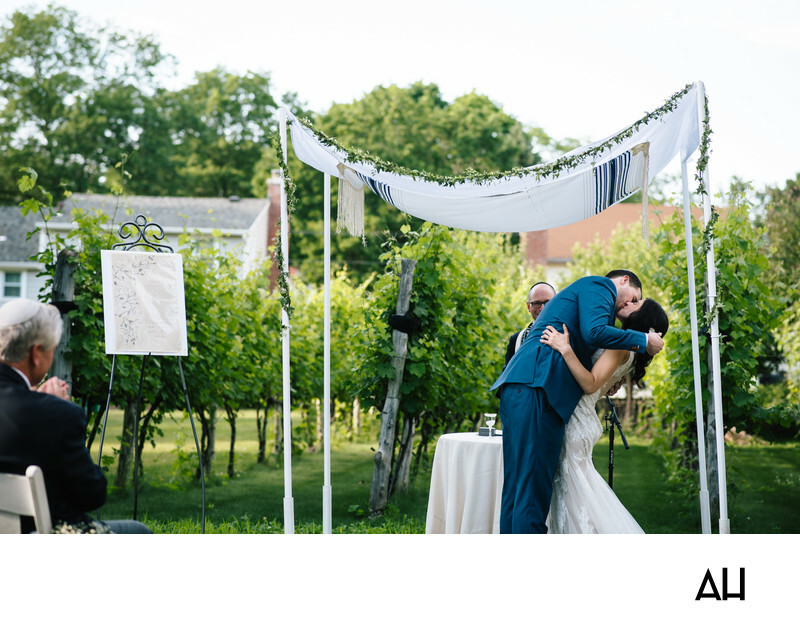 With its rich history and scenery, New Haven is a wonderful place for a Connecticut wedding. In this selection from New Haven Wedding Photography, the bride and groom share their first kiss as newlyweds. The wedding ceremony followed traditions and customs of the Jewish religion, the most apparent one being the use of the chuppah. The chuppah is a canopy made from four poles and a cloth. The cloth used is often a tallit, another Jewish custom this couple followed. The chuppah is meant to symbolize the home that the couple will build together, one that is open to all of their loved ones. As the newlyweds kiss beneath the chuppah, guests look on and clap affectionately. This outdoor wedding ceremony took place at a private estate in New Haven. The estate is home to a small vineyard, which is where the marriage ceremony took place. The groom wears a blue suit, and he tips his bride back as he embraces her and their future as husband and wife. The bride wears a beautiful gown that flows about her in swaths of sheer fabric and white satin. The couple smile as they kiss, enjoying this moment that signifies the beginning of an exciting new chapter in their relationship.